TIN MERZOUGA — TADRART, ALGERIA — Exploring in the sand this morning I realized the black rocks we were walking on in some spots were actually the top of these walls and rock formations that had already been covered with sand. Dunes were forming on top of the rock, and we were driving on top of the dunes. Below us I could see exposed rock walls and formations in various stages of erosion. Some were partially covered by the sand. 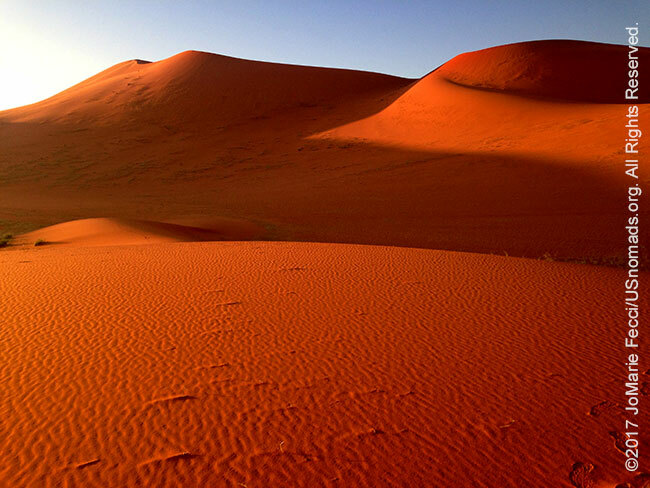 The realization that the eternal desert is itself truly ephemeral and constantly changing. The dunes move, the sand covers more rock, the rock itself crumbles and becomes sand. The only constant is the wind and even that apparently changes direction at different times of the year. 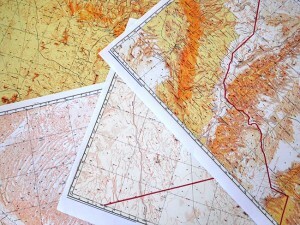 The Sahara is complicated. It has its own rhythm and we were becoming used to it. Or I should say “I,” as my colleagues grew up here and it is natural for them. Yet, they appreciate its beauty and the gift of freedom that the tenere gives to Tuaregs and visitors alike. We continued our journey of exploration, discovering a few more of the many examples of rock art that speak across the centuries to tell the story of the ancient peoples who once passed through this land. Their art also tells the story of the Sahara. A story of slow but unstoppable change. Wind and water shaping a world. People and animals leaving only traces. We don’t know much about the makers of this art. Their history is elusive. We don’t know whether these works had some kind of symbolic or ritualistic role, or whether they were recording their stories, or just making expressive art propelled by the same creative impulse we feel today. What we do know is that this “museum” contains the work of multiple artists across thousands of years. Some of the work is incredibly expressive and elegant. Some times we have scenes depicting events, other times it is a single animal. The most prominent art historians/archeologists who have studied the art of the Tassili have made different classifications of styles which correspond with general time periods, but I have the impression that there is still much work to be done in the study of the engravings and paintings found here. There may be much more to uncover with methodical exploration. For myself the body of work taken as a whole has been very powerful, creating a sense of connection across time. Stories told and re-told. The art of life. Our journey had a bit of drama of its own today when the truck had a new problem that couldn’t be fixed by banging it with a rock. Luckily Mohammed is a skilled mechanic and was able to fix it after disassembling and reassembling a few things. Important lesson for me is that I really need to learn a lot more about the mechanical functioning of the vehicles so I can be better able to diagnose problems and then figure out what can be done to improvise a solution in the field. This goes way beyond the sort of standard “field fixes” we learn in 4WD and Overland Expedition training. The local drivers here are very careful with their vehicles, showing a much greater level of mechanical sympathy than the average recreational Jeeper back home. They are not likely to “break” their trucks because of aggressive driving or risky “hold-my-beer-and-watch-this” maneuvers. It is the desert that wears on the vehicles. Drivers don’t break their axles rock crawling or crack their frames jumping dunes. More common here are burnt out clutches and problems caused by contaminated fuel. We finished up the day very close to the Libyan border on the edge of a massive dune field. Tin Merzouga is supposed to be the largest dune in the Sahara according to some people here. I am not sure that is technically true, as some other people say that the largest dune in the Sahara is in Libya. But regardless, these dunes are high. And they are also red. Well not exactly fire engine red, but a pinkish-red toned sand. From the heights we could see back towards In Djaren, and then far beyond to some kind of rocky landscape that looked like a series of ridges or maybe ragged fins fading off into infinity, seemingly all the way to the sun. The truck breakdown had been psychologically stressful for all of us I think, though we all kept calm and focused on fixing the problem. The repair brought a moment of tangible “relief,” followed by the successful climb up into the dunes which put us all in an exceedingly cheerful mood just in time for sunset.